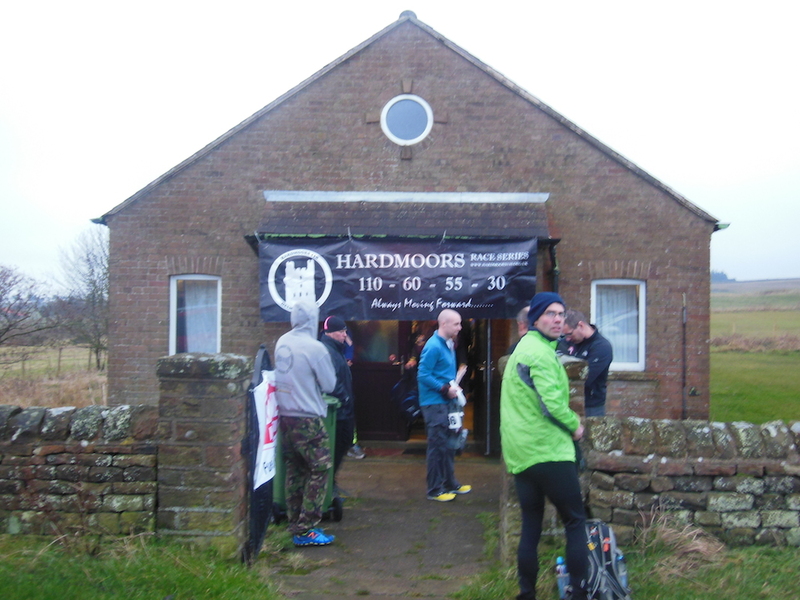 My ultra plan for 2014 is to do the Hardmoors Grand Slam of races. The first of which is a 30miler on New Year’s Day. I was really looking forward to the race and had put in a number of weeks of solid training. The only negative was a sore hamstring but thankfully it was fine and I never felt during the race. There is also a 15mile version which Katrina had signed up to so we were both involved. We travelled down with our good friends Neal and Caroline. Neal’s family live in the area so he had kindly sorted out for us to stay at his gran’s house in Pickering. So we met Neal’s Mum at his aunt’s house in Thirsk (hope you’re following this!!) and we went our different ways. Neal and Caroline were doing two parkruns in Leeds on New Year’s Day, one at 9am and the second at 10am. Neal tried his best to make out that two hard 5k’s were going to be much harder than a 30miler but he didn’t convince anyone! Katrina and went out for a lovely meal at a restaurant in Pickering before watching a bit of TV and earlyish to bed. We were up at 6.30am and away by 7.30am arriving at race HQ at 8.15am in time to register and get ready for the 9am start. Katrina’s race started at 11am. The hall was already pretty packed but we found a chair and some room to sort out our gear. It was good to have a chat with Dave Karmis who I’d run a lot of the Hardmoors 110 race with in 2009. 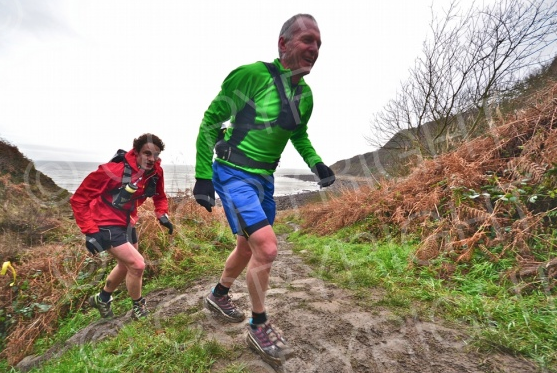 He is the first to have run over 1,000 miles in races on the Hardmoors route. 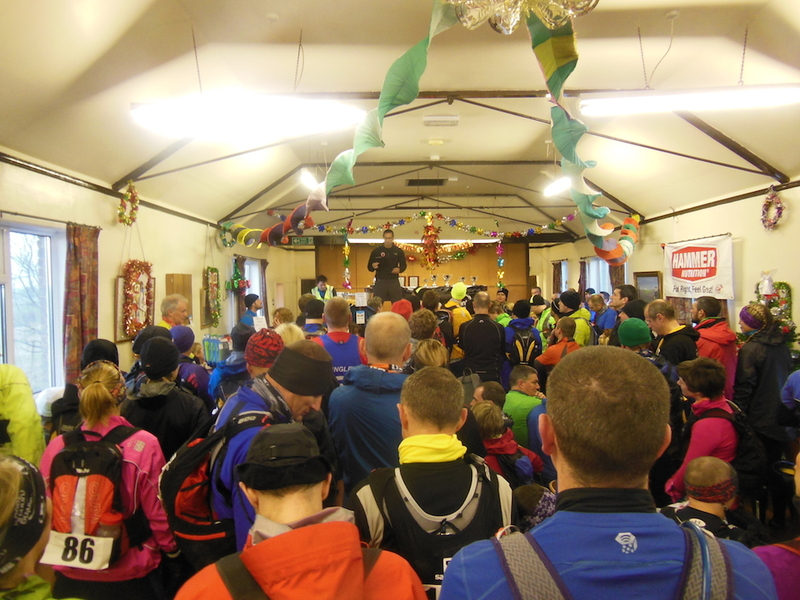 Just after 8.45am Jon Steele, race director, called us together for the race briefing. Jon started the Hardmoors races with the 110 in 2008 and now has 4 ultras and several marathons/half marathons/10k’s in his portfolio. He has been able to maintain a great atmosphere and spirit and it was great to be racing again on one of his races. We head outside just after 9am for the start. The weather was cold but dry and the forecast was for the same until 12noon or so when we were due some strong winds and rain which is what we got! I wore my Stenson Evo Hoka’s, drymax socks, skins and shorts, two tops, gloves and buff. I also carriers my North Face rucksack with OMM jacket, spare gloves, head torch etc and food and drink. The route was two loops with the first one south along the Cleveland way to Hayburn, then returning on the cinder path to Ravenscar. Then the second loop was along the cinder track to Whitby before returning along the Cleveland Way. The 15mile route followed the same path but cut down after 3miles or so before we reached Robin Hoods Bay. Here is the profile of the route. So the route was definitely two very different halves. When we were on the Cleveland Way heading south it was very, very muddy and undulating and when we were on the cinder path (disused railway) it was a solid track and very runnable. I set off about a third of way down the field of about 150 runners. The first half mile or so was on the road until we joined the Cleveland Way. The path then was mainly single file but I was able to make my way past people. I was keen to try and run to my heart rate for the first part of this race so glanced down fairly regularly. I was aiming to keep it around 148 and making sure it didn’t go over 150. I was feeling very comfortable at that pace and enjoying the race. The fact that my hamstring was absolutely fine helped as well. The first few miles ticked past easily. I caught up with a group of 6 runners who I took a bit of time to get past but that was fine. At Hayburn we left the Cleveland Way and climbed up the hill. Just before the checkpoint there was a guy taking photos from summitfever but as I saw him I slipped so my photo shows me doing a 100m start!! Thankfully he took a second photo with me up right with a smile on my face! .. I gave in my number at the marshal and headed up the hill. 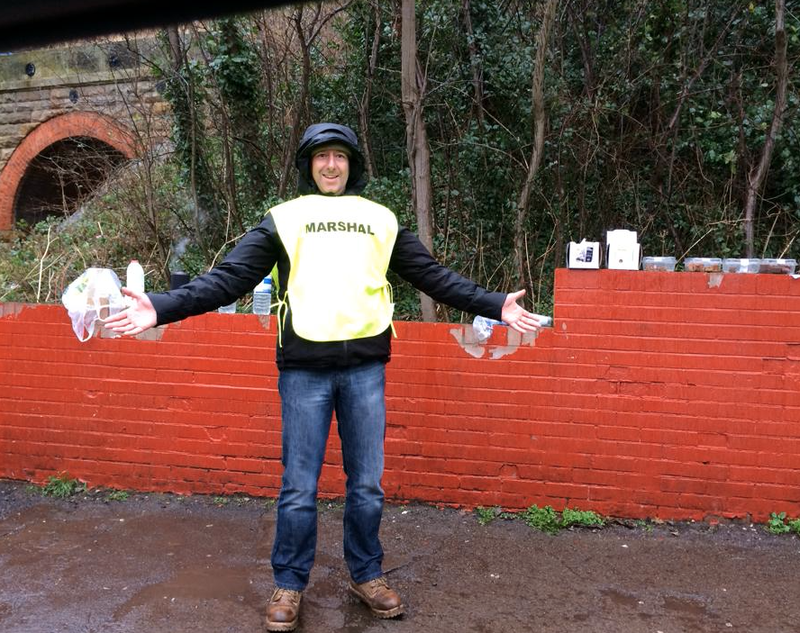 All the marshals were superb and did a tremendous job especially as the weather turned so bad later in the day. I caught up with a couple of guys on the cinder track. One of them had done the race last year and said that he’d gone too fast on this section and had struggled at the end so was going to take it easier this year. I decided that I would go with the flow and run strong but keeping an eye on m year rate. My Hoka’s weren’t the best on the muddy ground but they came into their own on the track. I knew I had the best part of 15miles all the way to Whitby on this terrain so was keen to make the most of it. The weather was still quite mild and I had my buff and gloves off. I was running really smoothly and loving it. I couldn’t see anyone ahead and didn’t look behind so was in my own little bubble. The guy I’d passed had said that he finished in 5hrs 30mins or so last year. I started to think a bit more about what I should aim for. I had posted that my gold time was 5hrs 30mins but I started to realise that I could be quicker than that. There was still a long way to go but it was good to be thinking positively. Before long the bridge came into view which Jon had said was the point where we leave the track to go back up to the start and finish at Ravenscar. We had just over a mile or so on the road to the village hall. I passed a few runners who were getting ready for the 15 mile race. One said I was looking good and well up the field. I had no idea of my position but it was an encouragement to think I was going well. As I entered the hall to given my number I saw Katrina walking away heading for the loo. I had to shout three times before she heard me above the noise of the hall! We had a quick chat. I told her she would fine the coastal path difficult in her Hoka’s but she’d love the cinder track! I refilled my water bottle and grabbed some flapjacks and I was away again. I set off again in high spirits. I was going well and looking forward to getting back on the cinder track and seeing if I could catch anyone ahead! 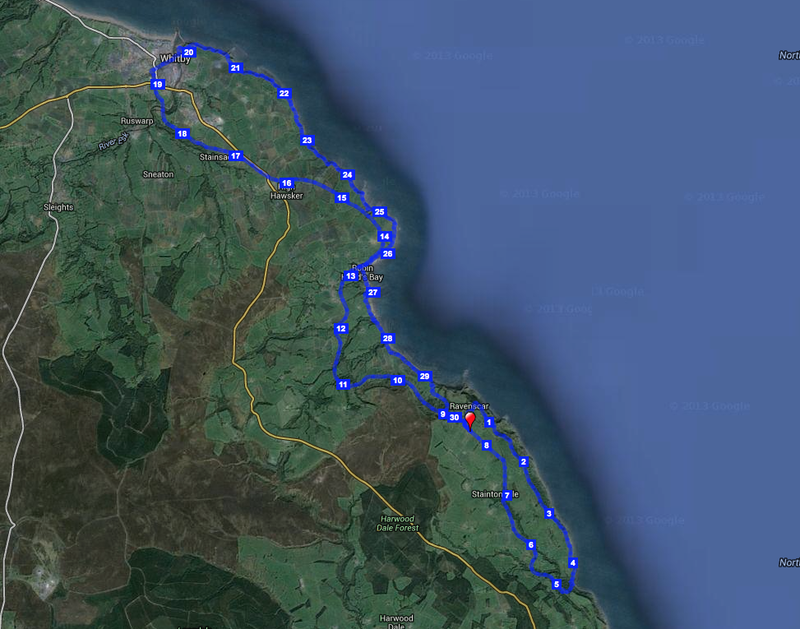 I seemed to be a gradual downhill run all the way to Robin Hood’s Bay and I averaged 7.37 pace for the 5miles. I definitely felt that sub 5hrs was a good possibility! I spent time trying to work out whether I might see Katrina on route. Initially I thought if I took 6hrs then there seas no way. But if I took nearer 5hrs and she took around 3hrs I might see her! Time would tell. The miles flicked by and I ran smoothly and was really enjoying being out in the race. I didn’t see anyone ahead until about a mile from the checkpoint at Robin Hood’s Bay. For this race I was trying out a new drink I’d been given to review called Matrix Nutrition Energy Boost. I will do a review soon but basically I really enjoyed it and will be using it again. I took regular sips along the way. I also ate a few sweets. I was taking video clips along the way as well so I’ll put that together at some point! I came into the checkpoint at Robin Hood’s Bay feeling really pleased with myself especially as I went past one guy who was stopping to refill his water! There was a climb out from the checkpoint and I could see a runner ahead so I decided to try and catch him over the next mile or so. I ran all the way up the hill at a steady pace and gradually I caught up. I went post as he stopped for a drink. I quick hello and I carried on. I felt a man on a mission! Once more the track was a gradual downhill run so I was able to keep up a good sub 8min mile pace. For me this is fast in an ultra but I reasoned that this was the shortest ultra I’ve done and also if the Cleveland Way back was anything like the first 4miles then I would naturally have to slow down anyway so I might as well make the most of this bit. I looked at my watch as I reached 15 miles and the half way point. It was just under 2hrs 8mins. So double that would give me 4hrs 16mins. Obviously I wasn’t going to be able to keep that going but even if I slowed down by 45mins I would still be under 5hrs so that became the goal in the back of my mind. It would all depend on what the route was like on the coastal path. I had downloaded the route onto my Suunto and it worked a treat. The route was very straight forward and Jon had done a great job in marking it out but it was good to have the reassurance of following the line on my watch! It was like a comfort blanket!! The views of Whitby Abbey were great and the weather was still fine. I even started to think that maybe the weather forecast was wrong and we would have a dry day! I caught a couple more runners in the last mile to the checkpoint at Whitby. 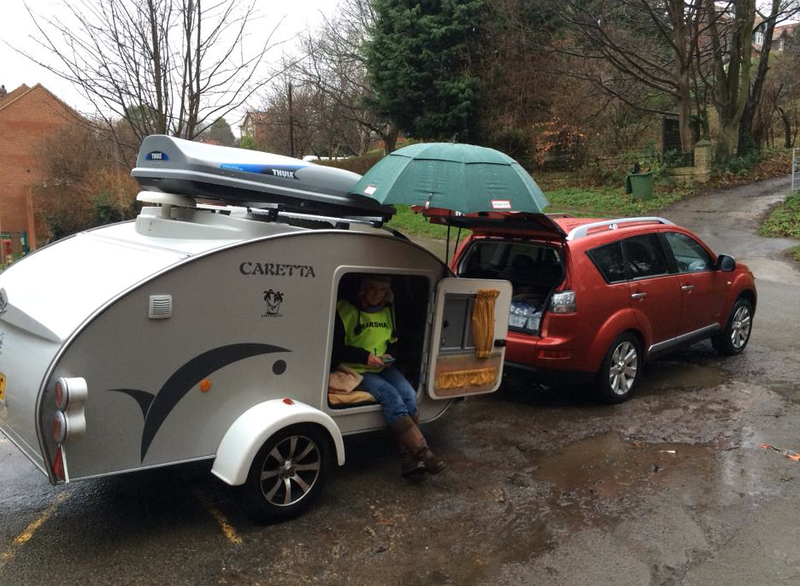 My friend Steve Walker was there with his caravan. I had put my powder in my water bottle so Steve quickly filled it up and I was away again heading into Whitby and the Abbey. Steve said I was flying and smashing it which was fun to hear! I caught another runner at the checkpoint and asked how he was. He said it’s been fine until now but I’m struggling. I hope he finished okay. Jon had warned us about the run through Whitby and he was right as we did have to make our way past lots of folk out doing their gift shopping. The highlight for me though was two ladies drinking tea outside their shop who knew the race was on and clapped and cheered as I went past. It’s amazing the boost you get from someone taking time to acknowledge what you are doing. So thanks to those ladies! As I climbed up the steps to the Abbey I started to think about the last time I was here … doing the 110 mile race in 2009. This was a walk in the park compared to that day so I had nothing to feel bad about!! I could see a few runners ahead and wondered whether I might pass them. I’d asked Steve’s partner at the checkpoint what position I was in and she’d said 24th so I did wonder whether I might get in the top 20. Another little goal to keep me going. Once we got onto the coastal path I soon realised that it was going to be a lot harder. The path was really muddy and slippy which just doesn’t suit the Hoka’s. Also the wind was righting our faces and starting to get stronger. Plus it started to rain!! So basically for the last 10 miles we were running into the wind and rain on muddy ground. I wasn’t catching the guys ahead but I wasn’t falling too far behind at least at first. I knew it was same for everyone so I just got on with it and tried to keep going as fast as I could. There were little sections of slightly better ground so I tried to make the most of them but the majority was muddy and I cold see my average pace slipping to 9.05 to 9.15 fairly quickly. I knew to get under 5hrs my average pace would need to be sub 10 mins a mile. There was not much I could do but try my best so that’s what I did. The rain got heavier so I realised I really should stop and put on my jacket. I delayed for as long as I could but I could feel myself getting colder. I’d just gone past a runner who was also finding the path very difficult to run on. He went past me as I put on my jacket but I caught him again as we entered Robin Hood’s Bay for the second time. I immediately felt a lot warmer with my jacket on and ran into the checkpoint soaking wet but still with a smile on my face! 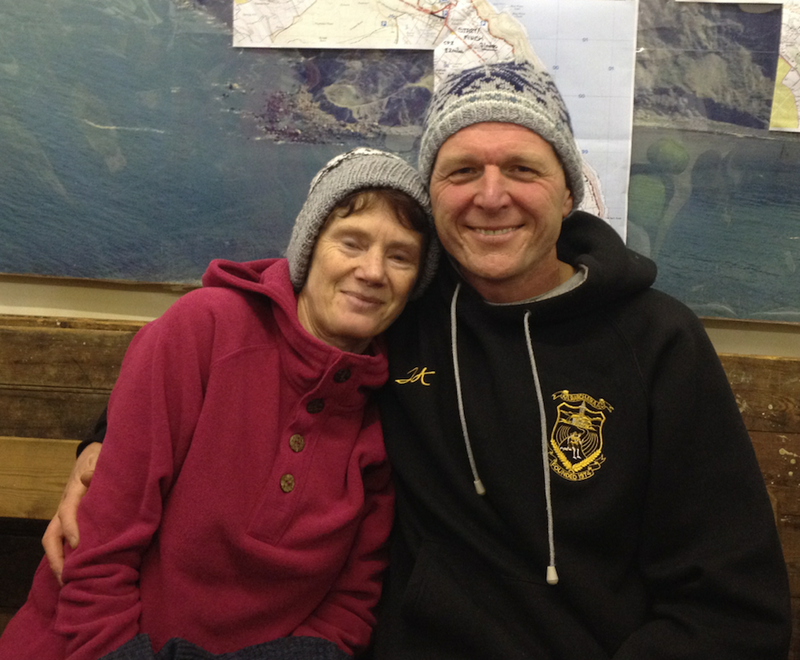 The couple at the checkpoint were doing an amazing job. The lady had the easier task as she sat in the car taking the numbers while the guy refilled my water and sent me on my was with lots of encouragement. Thanks to you both for giving up your New Year’s Day to marshall that point! I knew I had about 4 miles to go and 53mins to do it if I wanted to get under the 5hrs. To be honest I was keen to do it if possible but the terrain was against me and so I would be really happy with whatever the time as it was still going to be well under the 5.30 I’d set myself! There is a very steep hill in Robin’s Hood Bay and I made my only slight mistake here. I went too far down so had to climb back further up that I needed to. I wasn’t the only one as another runner did the same. The guy I’d passed earlier before the checkpoint appeared on the right path as we rejoined it! No real damage done and off we went. The guy who also went slightly longer said he lost the plot anyway so didn’t really care!! The rain and wind was even stronger now and I did think that those behind me who were going to take over 7hrs were going to get the worse of it. After a mile or so the 15 mile route rejoined us and I ran past a couple of ladies who were in that race. Over the next 20 mins or so I went past a few more. It was good to be able to encourage them. Looking at their pace I reckoned that Katrina should be ahead and so I thought I would see her until the end! 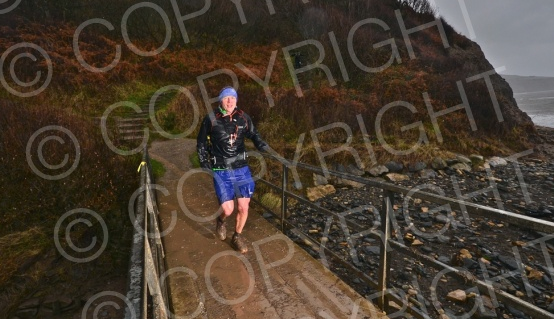 The summitfever photographer was stationed at the end of a bridge so I concentrated on not falling over this time! You can see from the photo just how wet I am. I was really pleased with my new OMM jacket. It certainly did the job. I found that the hood sometimes slipped off as we were running into the wind so I put my buff on the outside which did the trick. I probably didn’t look great but who cares when it keeps you dry!! I think another 30 runner went past me and I went past one. Then with about a mile or so to go two ladies went past me running really smoothly. I tried to stay with them but they were covering the ground so smoothly. I realised the next day who they were as they joined us on our recce run. Kirsty and Bonnie had paced it really well and finished 90secs or so ahead of me. I could see them not too far ahead as we climbed up the hill away from the coastal path to the finish at the village hall at Ravenscar. My watch flicked onto 5hrs with less than a quarter of a mile to go. I wasn’t disappointed as I’d had a great race and loved it despite the weather over the last two hours. I asked Shirley how Katrina did and she said she finished a few minutes ago. Katrina was getting changed in the toilet but I just changed in the hall as I really needed to get some dry, warm clothes on quickly. I was changed as Katrina came out. She had finished in 2hrs 58mins 06secs despite taking one wrong turn and adding half a mile or so onto her run! She was very cold so once the prize giving was over we drive back to Pickering for a bath and shower. So thanks to Jon, Shirley and all the marshals and volunteers for a great race and day out. So that’s race 1 over …. 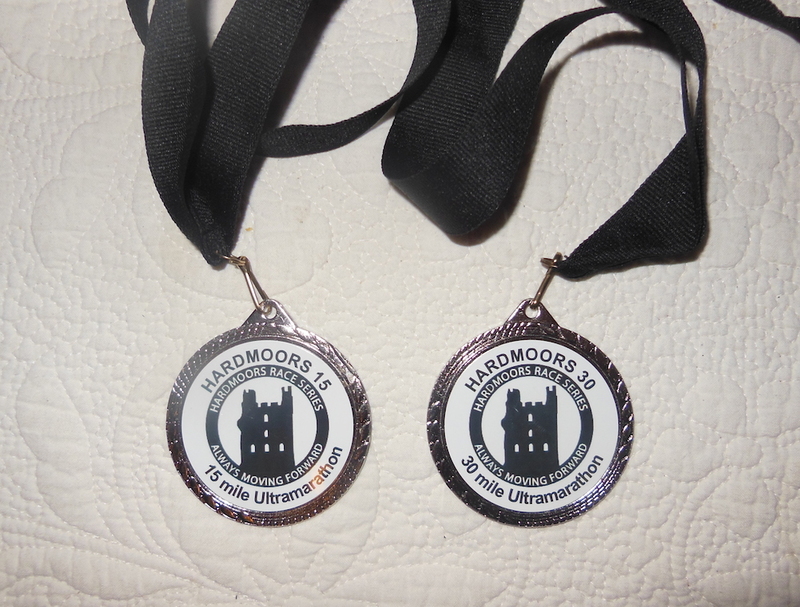 3 to go in the Hardmoors Grand Slam! Finally congratulations to Mo McCormick who won my Guess My Time competition. Mo guessed 5.02.17 so was just 41secs out! A limited edition key ring is on its way!! This entry was posted in Hardmoors Race Report. Bookmark the permalink. Great start to the year John. Good luck with the training and the rest of the Grand Slam. Looking at the HR profile it looks like your paced it well, only a little dip between three and four and quarter hours. Pacing evenly with slippery underfoot conditions is hard, the weather at the end can’t have helped either but still you pushed on and finished strong. I sneaked a look at the terrain profile for the route before the race and thought that it might well be flat enough to get around 5 hours. The wet weather through December was bound to add lots of mud to the route so I really didn’t expect such a quick time. To get so close to 5 hours in these conditions and faster than anyone in your Guess My Competition is a great result. Thanks Robert. I was really pleased with my run. Sets me up well for the year! !